Small - $104.99 Only 3 left! Medium - $104.99 Only 1 left! Large - $104.99 Only 6 left! X-Large - $104.99 Only 2 left! The Day of the Dead is all about celebrating deceased loved ones so dressing to the nines is probably a good idea because your beloved departed loved ones are there with you in spirit. 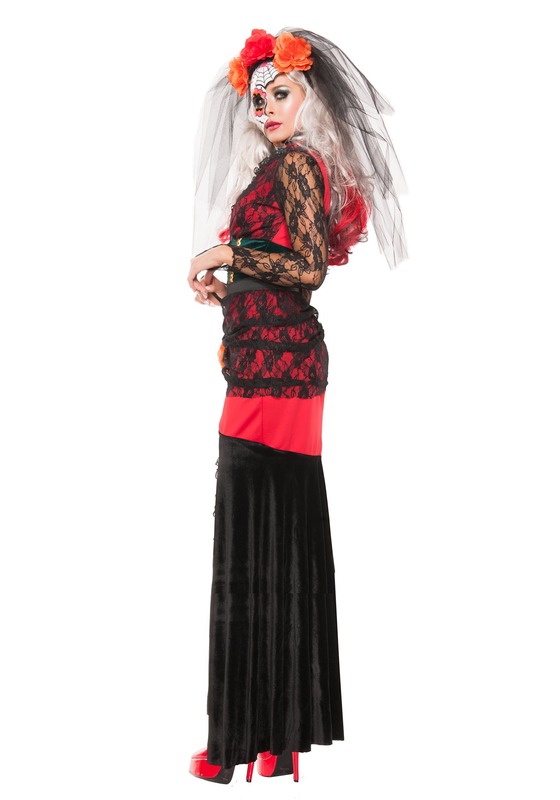 You have to look nice for them, so put away your sweatpants and take out this Day of the Dead darling costume. This floor-length style dress is akin to a gown because of the black lace long sleeves and the thigh-high leg slit. The fashion-forward look is topped off by a veil that is decorated with bright colored flowers.